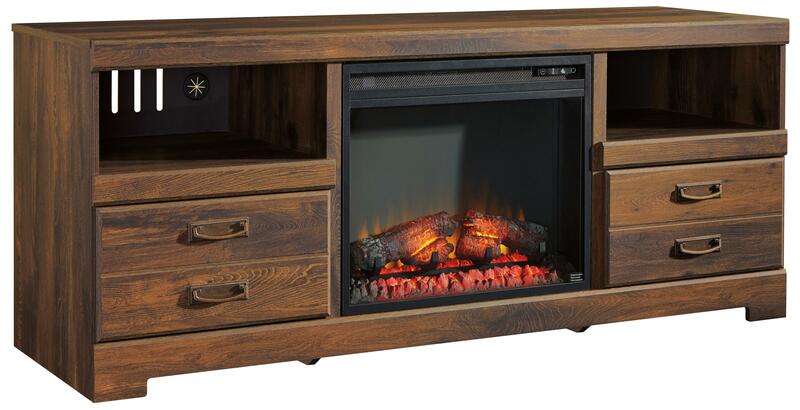 The replicated oak grain finish offers a rustic casual appeal to this TV stand with an electric fireplace insert. Its warm brown finish and simple design will look great in your entertainment space, while its spacious size and plentiful storage provides room for your TV, electronic components, and decorative accents. The fireplace insert has LED technology and a remote control with LED display. Its realistic wood burning flame effect combined with life-like logs creates an inviting atmosphere. It features two level temperature setting and a 20 watt high quality fan. The insert features a thermostat heating and overheating control device and a down light. Its flame operates with or without heat. The Quinden Rustic Casual Large TV Stand with Fireplace Insert by Signature Design by Ashley at Royal Furniture in the Memphis, Nashville, Jackson, Birmingham area. Product availability may vary. Contact us for the most current availability on this product. Storage Drawer interior (2) 16.50" x 15.00" x 5.00". Case Construction Laminate with Replicated oak grain. 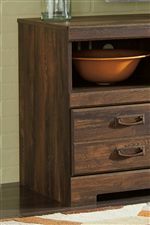 The rustic casual design of this collection features a warm dark brown finish beautifully complementing the replicated oak grain. The TV stand option offers style to the function of the ample storage to suit all your media needs creating the perfect addition to any living area. The TV stand is available on its own or with an optional electric fireplace insert. The Quinden collection is a great option if you are looking for Casual furniture in the Memphis, Nashville, Jackson, Birmingham area. Browse other items in the Quinden collection from Royal Furniture in the Memphis, Nashville, Jackson, Birmingham area.